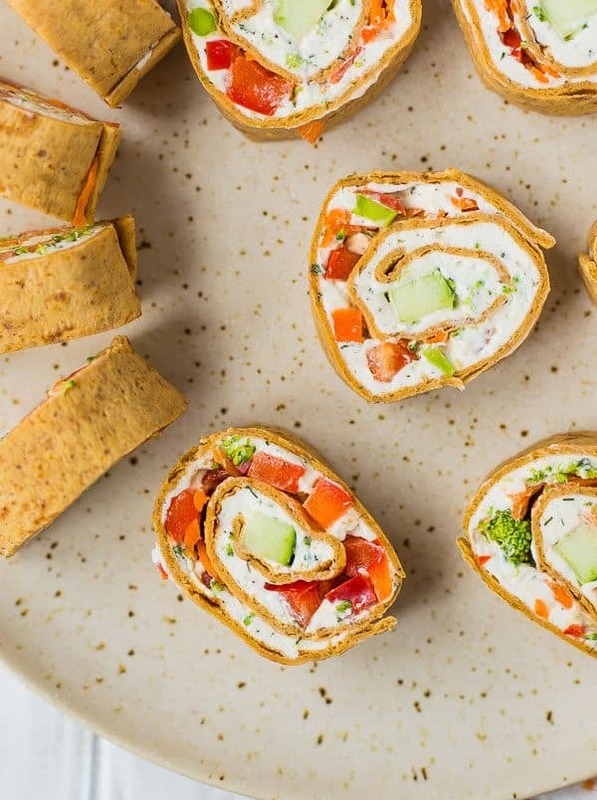 These vegetable cream cheese roll ups are full of crisp vegetables, flavorful herbs, and smooth cream cheese. 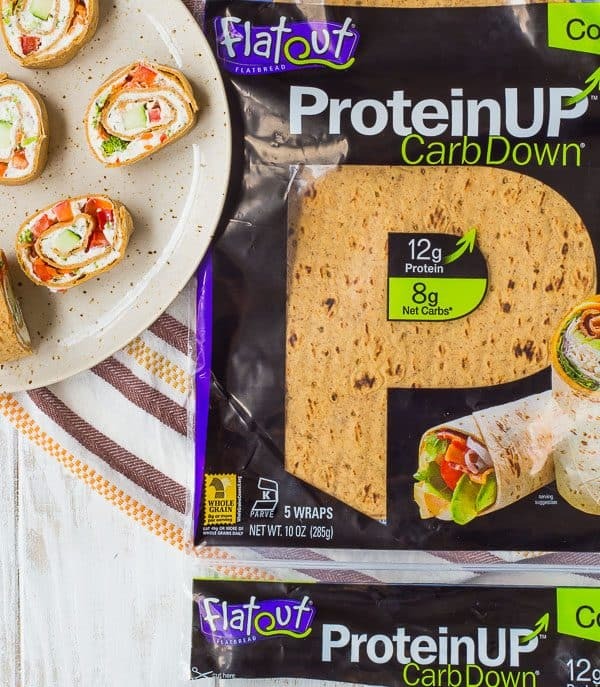 They make a great lunch or snack thanks to extra protein in the wrap! 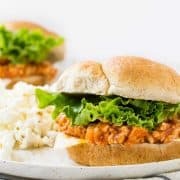 Anyone else getting tired of making school lunches? I need to mix it up a little but I of course want something that involves as little effort as possible. Making school lunch is not my favorite thing, at all. 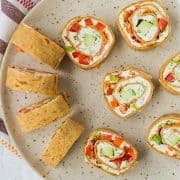 Cream cheese roll ups are one of my favorite snacks or appetizers to make and they also work fantastic for lunchboxes. I typically make them with tortillas like I did with my southwestern cream cheese tortilla roll ups and my pizza tortilla pinwheels, but this time I reached for Flatout. I bumped up the protein in this recipe by using Flatout ProteinUP™ Carb Down® Flatbread. It’s super soft and pliable but still strong. Plus, it has 12 grams of protein (in the wrap alone!) and only 130 calories. 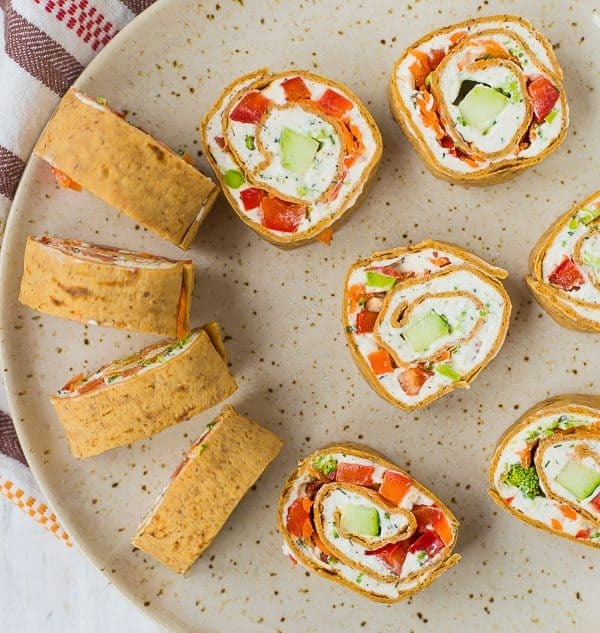 It’s the perfect vessel for any healthy sandwich or wrap, or these fun cream cheese roll ups. And it will keep those kiddos extra full! Customize These Cream Cheese Roll Ups! 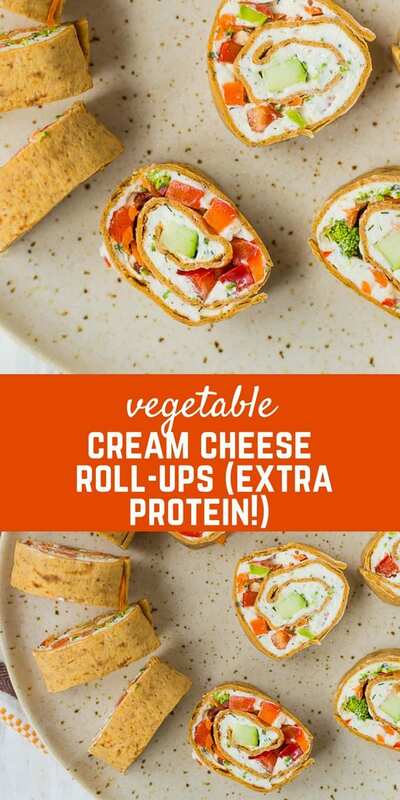 You can customize the vegetables you use in these cream cheese roll-ups, whatever you have on hand. The only thing to be careful about is the moisture content, you won’t want a super wet vegetable like tomatoes. As these are, they’re best eaten the same day, unlike other cream cheese roll ups that are even better the next day. These tend to become a little soggy the next day. They still taste great but they’re just not quite as…pretty. I thought it would look pretty! It does, doesn’t it? I wanted each roll to have a bite of cucumber in it. Since cucumber is a more watery vegetable, I wanted it in the center and not all chopped up to minimize the effects of its moisture. Everything else, I distributed throughout the rolls. I also want to mention the cream cheese. I used plain cream cheese and mixed my own herbs in. You could also use a chive/herb cream cheese or a vegetable cream cheese. I’d still add the dill to either of those, because I love the flavor of the dill with the vegetables. I used a whipped cream cheese because it’s easy to mix and spread, and I like easy. You know this about me by now, right? Happy summer, folks! These scream summer. Thank you, dill! I hope you love them! 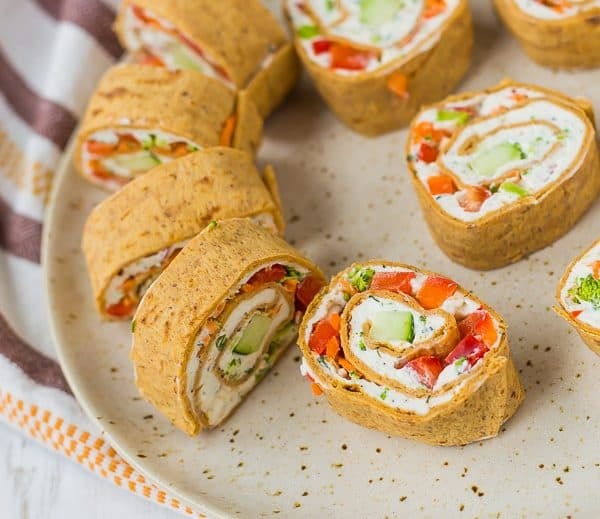 These vegetable cream cheese roll ups are full of crisp vegetables, flavorful herbs, and smooth cream cheese – a great lunch, thanks to extra protein! 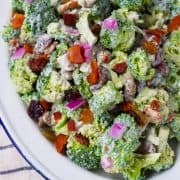 In a medium sized mixing bowl, mix together cream cheese, chives, dill, parsley, black pepper, onion powder, and garlic powder until well combined. Spread this mixture onto a Flatout ProteinUp CarbDown Wrap all the way to the edges in an even layer. Repeat on 4 wraps. Place cucumber slice on one end of roll (the shorter of the two sides), and then sprinkle all other vegetables evenly over cream cheese. Tightly roll up tortilla with the filling on the inside. Wrap in plastic wrap. Repeat until all tortillas are filled and rolled. Place wrapped rolls in fridge and chill for at least 1 hour before slicing into pinwheels about 1/2-inch thick and serving. Best served same day. Note: Chop your vegetables VERY – about 1/2 cup of each chopped vegetable is perfect! 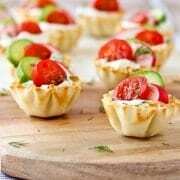 Verdict: I brought these as an appetizer to a Mother’s Day gathering and everyone loved them! Husband’s take: Honestly, I don’t even know if he tried them. Cream cheese isn’t really his thing. My dad, however, doesn’t like red bell peppers but he was devouring these! Yes! These are so great for any of those events.